The Barenboim/Cassiers Ring cycle has been doing the rounds for a few years now. The co-production between La Scala and Berlin Staatsoper has been in rep at both houses since 2010, and when Barenboim brought the Ring to the Proms this year, it was essentially in this production, with the orchestra from his Berlin company and most of the original cast. Now the cycle is coming out on DVD/Blu-ray, long after the excitement has died down, sadly, but, it’s still of great interest, especially for the many fans out there of Barenboim’s Wagner. Visually, the production owes much to the Fura dels Baus “Valencia Ring”. In both cases, the stage furniture is minimal, and scene setting is left to a giant screen that forms the backdrop to the stage, and on which abstract (for the most part) images are projected. The big innovation though, and the production’s main talking point, is the inclusion of dancers, the Eastman Ballet Company from Antwerp, in choreography by Sidi Larbi Cherkaoui. The dancers, or at least some of them, are onstage for almost the entire show, and a deliberate effort has clearly been made to take the opera as far into the genre of ballet as was possible. Typically, the singers will stand at the front of the stage, interacting but fairly static, while the dancers do their thing in the background, usually physical interpretations of one sort or another of the story as it unfolds. As the production demonstrates, there are many ways in which this can be done, some more effective than others. Wotan and Fricka’s exchanges in the Second Scene are illustrated with two dancers, standing behind and representing the two characters, but physically interacting in a way that makes explicit the tensions of their dialogue. Most of the dancing later on is more abstract, including the impressive ensemble pieces for the scene changes. The gold and the Tarnhelm are represented by the dancers too, the Tarnhelm particularly effective, the dancers surrounding Alberich and representing the helmet with their intertwined arms. No effort is made to similarly represent the worm or the frog at the end of the Niebelheim scene, which is a shame; I hope they have something more spectacular lined up for the dragon in Siegfried. The main problem with choreography idea is the conceptual distance between the dancing and the acting. This seems to be deliberate to a certain extent, and there is often a feeling that the singers are playing out the events on a literal level, while the dancers make explicit the emotional and physiological significance. But isn’t that what the music is for? In fact, the choreography mediates between the music and the drama, and when the dancers’ input is effective it adds to the coherency of the whole, although when it’s not, their gesticulations in the background are just distracting. While the singers are largely oblivious to the dancing, the few moments of interchange between them are particularly revealing. Wotan ignores the dancers throughout, signalling his self-obsession and his refusal to anticipate the consequences of his actions. Other characters have more ambivalent attitudes to what is going on around them. Most effective, though, is Loge’s attitude to the dancers. In direct opposition to Wotan’s ambivalence, Loge is aware of what is going on at every level, and his willingness to engage with the choreography demonstrates his engagement with the physiological level the dancers are representing. He even dances with them himself at a few key moments. Loge is also the focus of attention at the end, and although the representation of the Gods’ Entry into Valhalla is disappointing visually, the compensation is that the audience is left considering Loge’s view of the events, his prescience linking this ending with the drama to unfold in later instalments. The choreography seems to justify a fairly static Personenregie; there is some great acting from the singers, but it is rarely of a physical kind. Vocally, the cast is strong, with René Pape leading from the top, his Wotan lyrical and smooth, but also dramatic and impassioned when required. Johannes Martin Kränzle and Stephan Rügamer, as Alberich and Loge respectively, are both known quantities as Wagnerians, and their already impressive credentials are further enhanced by excellent performances here. That said, both stand out, at least in part, because director Cassiers has good, clear ideas about what to do with them. Jan Buchwald’s Donner is a similar case, well sung and well directed, but Marco Jentzsch as Froh, Wolfgang Ablinger-Sperrhacke as Mime and Kwangchul Youn and Timo Riihonen as the giants, fine performers as they all are, don’t sit comfortably in this production, which always seems to focus the attention away from them, usually towards the dancers. The Rhinemaidens give a reasonable performance, although one of them, and I think it is Aga Mikolaj as Woglinde, doesn’t blend well into the ensemble, preventing their sound from unifying as it should. Doris Soffel, as Fricka, has quite a penetrating vibrato, wearing on the ear if not actually ugly. She has a few tuning problems as well, but these are small and only stand out because of the high level of accuracy among the rest of the cast. Barenboim gives an impressive reading of the score, dramatic and coherent, but always taking his cue from the pace of the stage action, rather than seeking to dictate it. The orchestra is good, although not as idiomatic as the Berlin Staatskapelle, who would soon after take on this production. The low brass is disappointingly civilised, and the string section, while accurate and energetic, lacks the dark colouring that made the Berlin orchestra’s performance so special. The video was recorded for the Italian state broadcaster RAI. Production-wise the most annoying aspect is the title sequence, for which chunks of the music are crudely pasted together for background. The production itself is presented well. All the singers wear microphones (visible on the high-res images), and no effort is made to distance them from the listener for the sake of dramatic placement – at least not in the stereo mix. The choreography poses an unusual challenge for the cameras, as it is often the case that the focus of attention is on two sides of the stage at once, the singer on one side and the dancer representing them on the other. Sensibly, the cameras often just ignore one or other, usually the dancer, although they sometimes wonder into the frame, giving the viewer the frustrating sensation that they are missing out on something. No extras are included on the DVD. Subtitles are in German, English, French, Spanish, Italian and Korean. 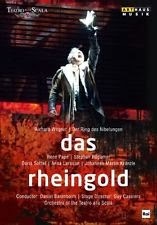 This is a fascinating Rheingold and well worth seeing. Objections raised to it in 2010 included charges of anti-intellectualism and indifference to the work’s political dimension. Those are probably fair criticisms, but there is a great deal of physiological engagement with the story here, not least from the dancers, who really have something interesting to add. Wagner would probably have hated it, but that’s no reason for us to pass it by.